A University of Southampton researcher suggests that new types of sharks could be heading to UK waters as a result of warming seas. 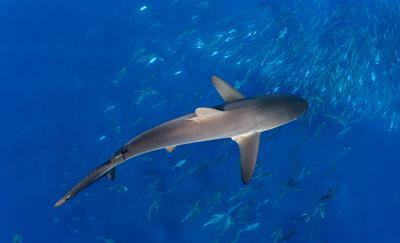 Dr Ken Collins, Senior Research Fellow from the University of Southampton, based at the National Oceanography Centre Southampton, has forecast that 10 species of sharks currently found in warmer parts of the world, such as hammerheads and blacktip sharks, could be swimming in British seas within 30 years as the climate changes. And a new 'shark map' reveals the places where the fish are already found in UK waters. It names Cornwall as the country's shark capital with at least 20 species found off the coast, followed by the Scilly Isles and Devon. More species could be heading towards the UK from places such as the Mediterranean and the coast of Africa as seas become warmer due to climate change, according to the research commissioned to mark Nat Geo WILD's week-long "Sharkfest" of TV programming this week. They need protection, according to Dr Collins, who was previously an administrator of the UK shark tagging programme. Dr Collins said: "It's likely we will be seeing more sharks spread from warmer regions such as the Mediterranean Sea towards our waters in the UK over the next 30 years. He added: "Though while the potential number of shark species around the UK may increase in the next few decades, the overall number of sharks, especially the larger ones, will fall as a result of over-fishing, plastic waste and climate change. "It's really important we work together to prevent a premature extinction of these wonderful creatures." He also said he saw "no reason" why there should not be great white sharks in UK waters, as they were found in colder waters off South Africa and favoured seals - found in Cornwall - to eat. A spokesman for Nat Geo WILD said sharks had been portrayed for too long in a one-dimensional way, as terrifying predators, and Sharkfest aimed to reveal the "true awe-inspiring nature of sharks".